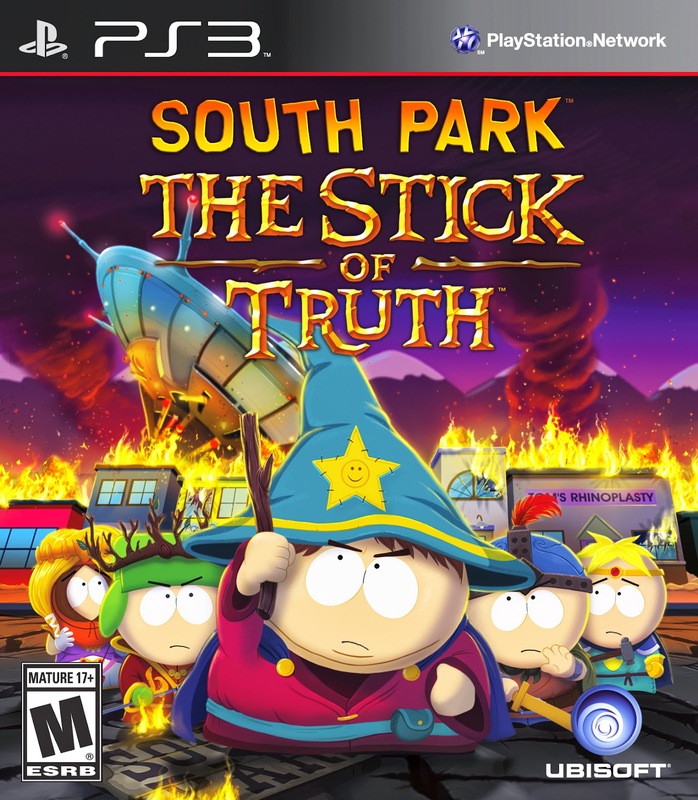 The kids are currently participating in a giant war between the humans and the elves, to protect the Stick of Truth (the owner of which can control the universe) and they want you to join their army. Whilst it starts out as a simple game between two groups of kids, it quickly spirals in to something a lot more, escalating in such a way that you become the focus of more than one battle between good and evil. The scripting is fantastic, and the evolution of the story flows smoothly from one plot point to another. You get to make your character from scratch with a very simple to use creation tool, although the course of the game you will be able to edit pretty much everything about you by finding things like new outfits or new wigs. Your weapons and costumes that you find will give you different benefits to make you a more powerful warrior. When you first start, you will be taken to see the king of the humans, who will teach you basic combat, as well as getting you to choose a class for your character. You have a choice of being the classic RPG trio of Mage, Fighter or Thief, as well as a 4th option, which allows you to play as a Jew. Each class has its own benefits, so it mostly comes down to preference. That said, they all play fairly similarly, which is a little disappointing. Each of them have their basic attack with a Melee weapon, as well as with a Ranged weapon. These aren't restricted by what class you pick, so a late game thief and a late game mage are likely to be using the same gear. These attacks come down to pressing light, heavy, or magic attack buttons in time with what are essentially quick time events. Failing to perform them correctly results in a weaker attack, but after only a few battles you'll most likely have the timing down to perfection. On top of basic attacks there are class specific abilities, powerful summons that can only be used once per in game day, and item usage. You also have a partner in battle, who have their own unique moves and roles, such as being able to heal others, or increase your teams attack power. All the moves sound much more impressive than they are so as to keep in line with the humour of the show. Summoning a Frost Elemental from the north, equates to kicking a small Canadian child into your enemy (more commonly known as "Kick the Baby"). In all honesty, the gameplay isn't very hard. Even on the hardest difficulty, most basic enemies can be dealt with in a matter of turns, and later on you can often take out anything in 1 hit. Bosses can be a bit tougher, but even they aren't too much of a problem if you have adequate weapons. While it makes it very accessible for those who are new to this style of game, more experienced players will likely find it lacking in challenge. Aside from your main quest, you need to get more friends for your in game Facebook account. Doing so will see you perform tasks for many of the other inhabitants of the town, such as clearing a basement of rats at the local bar, or protecting the world from ManBearPig for Al Gore. The more friends you make, the more powerful you will be in your battle for the Stick. There are so many references to the show, that the game feels just like an extended episode for the most part, with the humour perfectly in line with its TV counterpart. 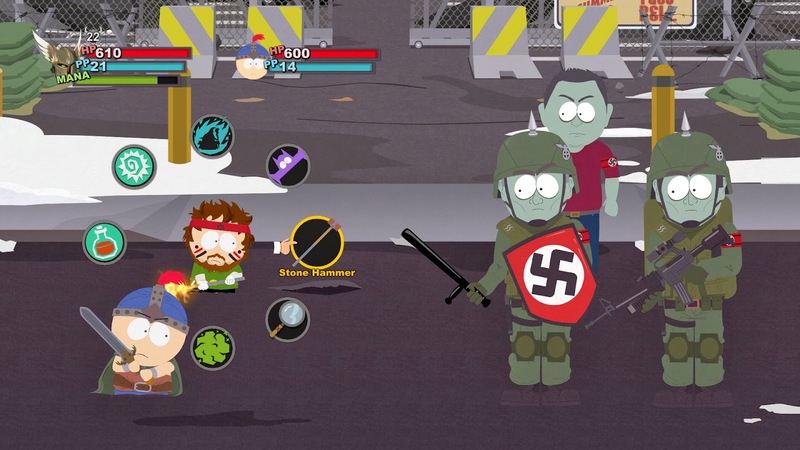 The graphics add to the feel of being in the show, with cut scenes being animated in the same way, and normal gameplayonly looking slightly different, while adopting the same style. All the voices are unsurprisingly authentic as well, and you can tell that a great deal of care has gone in to keeping it true to its roots. It's been a long time coming, but now that it's here, it is fair to say it has been worth the wait. Any fan of the show will most likely be a fan of the game. The low difficulty will allow players new to the genre easy access, while more experienced players can just enjoy the story. Having a bigger challenge would have been nice and is certainly one of the flaws, but it isn't too fatal a drawback, as the journey itself is more than entertaining enough as it is. Anyone who dislikes the TV series' crude form of satire definitely shouldn't be considering it however, as the same quarrels will come up, with controversial jokes about things like abortion, and many, many fart gags, and the game probably won't change your mind about these things. Those who are new to both the series and genre however may have a hard time getting their head around some of the in-jokes, but there is still enough here for you, with a fantastic script more than making up for a fairly average combat system with lacklustre difficulty.